This is the 6th post in the series, 14 Tips to Present Awesome Charts. After you have chosen the number of data points and created the chart, you now need to label your data. We discussed in the last post that you might require 30 data points to do your analysis but you can present it with only 10. Do you still need to label all 10 data points? Need not. 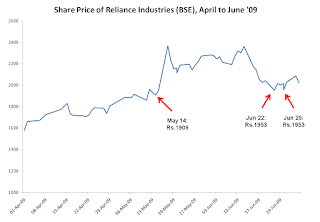 Example 1: You are studying the share price of Reliance Industries from April to June 2009. Will you label all the data points. No. Because it will become cluttered and will serve no extra purpose. In the above chart, you might label 3 data points and mention some event which took place on that day (like a court judgment) and how it impacted the share price. Depending on your key message you need to label your data points. What you must remember about labeling your data? 2. The labels should not clutter the chart and hurt audience understanding. Space them out and make them legible. The labels have to be seen properly. 3. Position the label properly on the chart. Labels on a pie chart can be inside the pie or outside. Make sure you choose what is right for your given chart. The objective that drives this choice is how easily readable the label is. Example 2: This chart is from ACC's website. Take a quick look at the bar on the extreme right. What is the value on the bar graph and the line graph? What is 5% and what is 7%? Confused? Spend some more time and you will figure out that the bar is equal to 7%. But why should you confuse your audience the way I confused you just now? The problem here occurred because the label for line graph was always above the bar and it was in black font. Suddenly for the last data point, the font changed its color. The 5% should have been in black font and can be placed on the left of the bar. Example 3: Again from ACC's website. Answer this question. 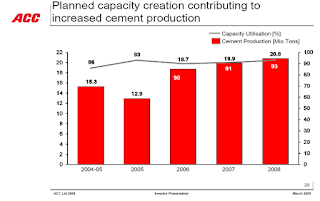 What is the capacity utilization (%) for the 5 years? 86, 93, 18.7, 19.9, 20.8. Right? Wrong? Take a look again. The problem: For the first two data points, the label for the line graph was above the line. For the next three, it went below the line and changed its color from black to white. The solution: If you put a % after the numbers it will be far simpler to read the chart. Also, be consistent with color coding of data labels. Use different colors for labeling different graphs (in this case, use different label colors for bar and line graph). Use this color coding when the labels have to appear so close to each other. When the labels are far away, color coding is not needed. 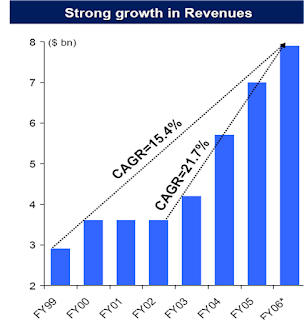 Example 4: This bar graph from AV Birla Group's website is making a point that there has been a strong growth in revenues. There is hence, no need to label every data point. 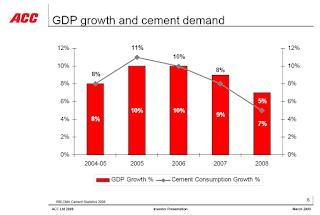 The Compounded Annual Growth Rate (CAGR) for two time periods is also given to prove that the growth has been strong. Example 5: This chart from Hindustan Unilever's website is interesting. They are comparing the market share of the company in General Trade (GT) and Modern Trade (MT). MT means the super markets and GT the Kirana or Mom-n-Pop Stores. 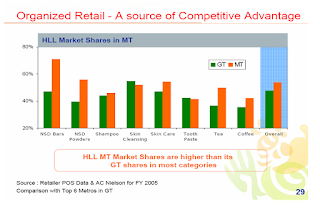 What is the overall percentage market share of HUL in GT and MT? GT (Green) looks like 45% and MT(Orange) 52%. I don't know. Why don't they label all the bars? Because, the key message here is that the company has more share in Modern Trade compared to General Trade in most categories. That is why we don't need labels above every bar. It will create clutter and will deviate the audiences' focus from the key message. The audience will start reading labels when there is no need to. However, they should label the last two bars so that we know the market share overall. It is impossible to read it visually. So, what did we learn about labeling data? 1. There is no need to label every data point. It depends on what point you are trying to prove with the chart. 3. Color code the labels. If there are two line grahs which are close to each other, label them in different font colors. 4. Position the label properly on the chart. Labels on a pie chart can be inside the pie or outside. Make it easy to read. We have now completed 6 Tips out of the 14. How are you liking the series? You agree to what's been said or you disagree. You need some clarification. You are going to make a chart and not sure how to? I am eager to listen to you. Leave a comment. Disclaimer: All charts have been used for educational purposes. They will be removed in case of any objection to anyone.